Bohemia Interactive Simulations (BISim) design and develop some of the most realistic battlefield simulators seen in today’s military sector. The company’s latest battlefield simulation, VB2 is an fully interactive high-fidelity desktop battlefield simulator which is already in use with military forces throughout the world, including the US Marine Corps, the Australian Defence force and the UK MoD. VBS2 is a fully interactive, three-dimensional, PC-based synthetic environment suitable for military training and experimentation. Developed by Bohemia Interactive, the creator of Operation Flashpoint and ArmA: Combat Operations, VBS2 offers both virtual and constructive interfaces onto high-fidelity worlds of unparalleled realism. VBS2 supports rapid, real-world terrain development and is interoperable via both HLA and DIS (through LVC Game). Through VBS2 script and intuitive modeling tools, complex weapon platforms can be created quickly and cost-effectively. From vehicle checkpoint functionality to UAV interfaces, Bohemia Interactive Simulations has proven time and again the true meaning of rapid development. Bohemia Interactive Simulations has a proven record at delivering on time and on budget, having completed numerous development projects for government agencies around the world. BISim can quickly develop models or terrain, modify the simulation engine to suit new requirements, integrate new hardware, provide training courses for VBS2 operators or administrators and also deliver flexible levels of product support. VBS2 is an out-of-the-box training solution capable of simulating a wide range of situations at the tactical level. 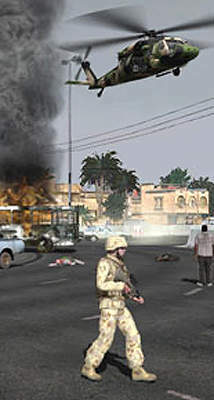 VBS2 can be federated with other HLA-compliant simulations to meet specific training outcomes, for example connecting dismounted infantry in VBS2 with a high-fidelity armored vehicle simulator, or simulating a special forces team conducting a counter-insurgency mission while the overall campaign is controlled by a higher-level constructive simulation such as OneSAF. VBS2 allows commanders, crew, soldiers and support elements to be immersed in the VBS2 environment across multiple simulation systems in an endless number of different configurations. Briefly consider a typical mechanized infantry platoon, and how VBS2 may provide training for all of the elements of that organization at a fraction of the cost of live training. Perhaps one squad is located in a small arms trainer using VBS2 TWS, with two squads in a separate VBS2 classroom. Air support might be provided by a VBS2 Aircrewman Virtual Reality simulator or flown by real pilots or AI on a VBS2 desktop trainer. 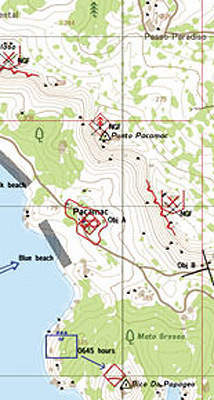 An instructor operator station (IOS) controls the flow of the scenario and manages OpFor elements in real time. Meanwhile the company commander (or higher) views a constructive simulation such as OneSAF, communicating with VBS2 via HLA. 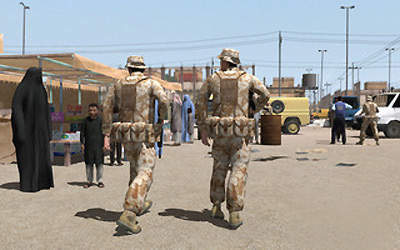 Bohemia Interactive has modeled hundreds of units, weapons and vehicles for the VBS series including USMC, ADF, US Army, UK Forces, NZDF, incident response, Eastern European and Middle Eastern representations. A wide range of structures and vegetation have also been modeled. These models are available for purchase through Bohemia Interactive Simulations.